The last original native English Lady's-slipper orchid lives on private land which is a protected site in Yorkshire. We are all discouraged from visiting this site. Rumour has it that this is guarded by a special botanical branch of the SAS who have a license to kill you and nuke your home town should you even ask where the orchid is. This photo is therefore a reasonable compromise as it is pretty certain that this particular orchid was planted here in North Lancashire probably more than 80 years ago. The genetic variation of UK and European C. calceolus may not really wide enough for any such split between Europe and UK populations to be made with such certainty. One theory is that the UK population actually arrived from continental Europe after the last ice age and so comparisons between the UK and any European population are likely to lead to similar profiles. There probably hasn't been enough time (10,000 years) for big enough evolutionary changes to register in the DNA of a UK population to make it unequivocally distinct from other European species if Europe was indeed the origin of our UK population. The populations of C. calceolus in other parts of the world such as Russia or China are definitely different from the UK and European ones according to enzyme and DNA analysis. 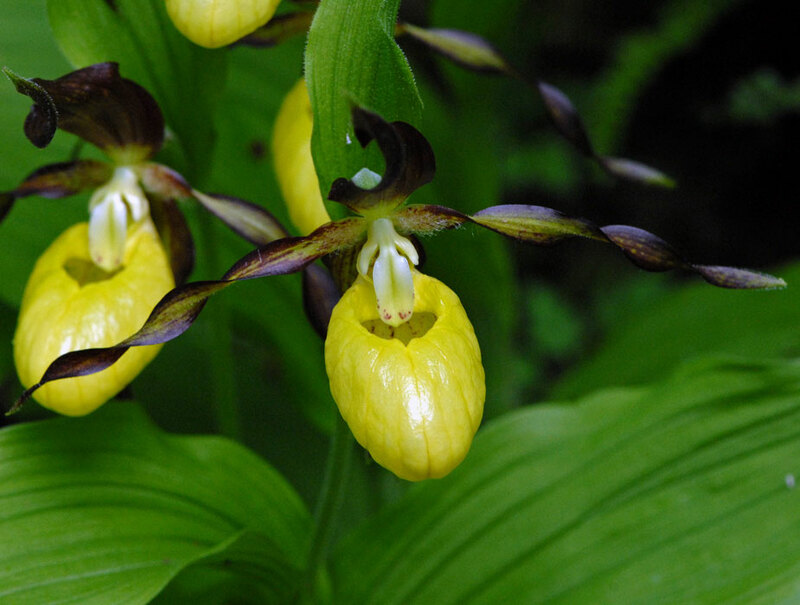 Of course the Cypripedium calceolus may have arrived in Europe/UK via eastern Europe and China which could lead to distinct significant genetic differences between it and those of a European descent. If this is right then there could be no significant genetic difference between this Lancashire ex Austrian specimen and the daughter plants cloned by Kew scientists from the last original C. calceolus in Yorkshire. So you might as well visit friendly Lancashire where the wardens are very helpful and don't wear guns. Daughters of the original are now (2009) flowering close at a site not far from this one but are also of course planted. It's certainly worth having in the photo collection because I think it will be many more years than I have left before genuine UK population Lady's Slipper orchids (if there ever can be such things) are on general view anywhere and I doubt they'll ever point you to the original plant. The Kew Cypripedium project has however now reached the stage where some of the plants introduced into the wild are regularly flowering. You have to hunt for them of course but these "daughter" plants are now growing in many northern English sites where they were once found. You can find photographs of the original Yorkshire orchid on the interweb taken by the English botanical aristocracy but us peasants will just have to make do with either the Silverdale orchid or the plants with many fewer blooms only recently introduced. I imagine that The Cypripedium Project will regarded as a genuine conservation success when a new plant arrives through natural seed generation and germination without the help of Homo kewensis and his slug pellets. Bearing in mind how slow growing this orchid is, I doubt we'll see that before 2050 and I'll be compost by then. In a TV programme explaining this much publicised and expensive conservation programme the interviewer asked one of the chief Cypripedium gurus what would become of the original - "Will people be allowed to see it?" he was asked. "No" he answered "and if I have my way it will live the rest of its days unseen and die in isolation". And we wonder why the public aren't that much interested in plants. This attitude is not uncommon and derives from the all too widespread and overwhelming protectionist beliefs of conservationists and their armies of wardens. Fortunately more and more of those of us in the botanical communities are coming to the opposite conclusion. We need to protect and conserve of course but we need even more to recruit the population in general to the cause of giving value to our wild populations of plants, birds and animals and you certainly don't do that by keeping them at bay. It's a balance of course but we've gone too far towards protectionist conservation in my view. Perhaps I've been unlucky but my 40 years of botanising seem to have been punctuated with many such brainless comments by conservation minded wardens determined to keep the halitosis breathing public away from a plant they seem to regard as their personal property. At the Lancashire site the orchid is wardened on a voluntary basis by people who want us to see it and are more than happy to tell you the history of the plant. Now that's the way to interest people in conservation. Incidentally this plant is often referred to as the rarest in the country but this is surely a bit of an exaggeration. It's probably the rarest spectacular plant in the country but native species such as Scleranthus perennis ssp perennis (Perennial Knawel - rather dull) or Hieracium snowdoniense (Snowdon Hawkweed - just another yellow composite) are also found only on one site and are even more fragile than Cypripedium calceolus. The Ghost Orchid (Epipogium aphyllum), last seen in 1986 was found again with just one flower in 2009 so C. calceolus isn't even the rarest orchid. 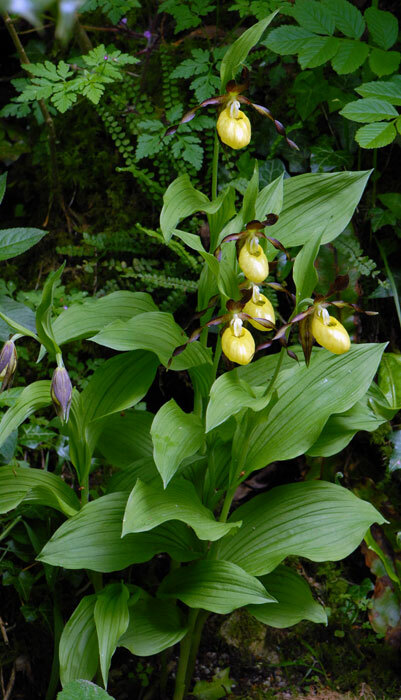 Named by Linnaeus no less, the generic name Cypripedium is a bit of a blunder. The Latin for the Goddess Venus is Cypris (she was from Cyprus according to mythology) and the Greek for a sandal or shoe is pedilon but pedium is the Latin (genitive plural) for feet. 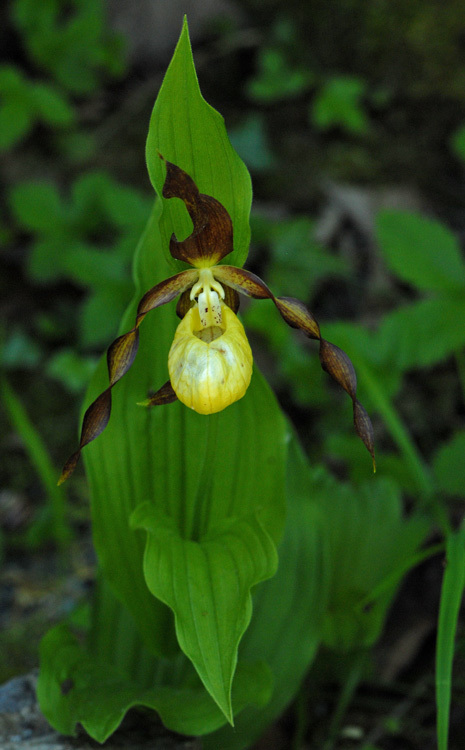 So Cypripedium, intended to be a hybrid of original Greek and Latin names, ended up meaning something else. Linnaeus himself suggested that Latin and Greek should never be mixed but he did mistakenly break his own rule and mix them in this generic name and it stuck. So Cypripedium really means Venus's feet. 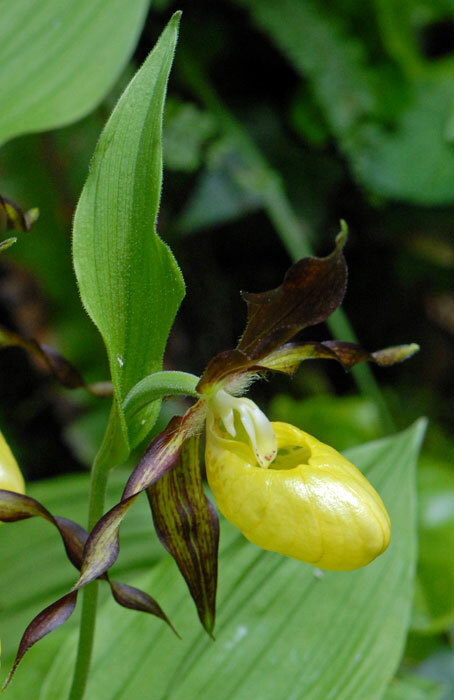 Later, perfectionists (probably wardens or taxonomists) suggested that the name be changed to Cypripedilum but naming rules prevented the change as Cypripedium isn't actually a spelling mistake. We all think Linnaeus wanted to call the Lady's-slipper Orchid after Venus's shoe as the flower reminds you of a shoe but ended up naming it after her feet. calceolus means little shoe so some people still call the orchid: The Little Shoe of Venus.